Coming home to a mess-free and odor-free house is a dream of many pet parents. And while dog potties provide a fashionable turf right inside your home for your 4-legged friend to pee on, sometimes these aren’t really that practical. Enter the best pee pads that serve more like your baby’s disposable diapers but in a floor mat form. Pee pads can be excellent tools for housetraining your pup while also aiding older and sick dogs that may have problems getting to the bathroom outdoors when they really need to go. And if you’re wondering which brands are considered by many pet parents as simply the best, hang on to your seats as we bring you 5 of them. Pet parents love using the AmazonBasics Pet Training and Puppy Pads for a number of reasons. It comes with natural attractants making it a cinch to entice puppies and adult dogs alike to go potty into the pee pad. This also helps simplify housetraining. The pee pads come with a 1.5-inch plastic barrier forming the perimeter of the pad which effectively keeps urine and other liquids within its borders. On top is an anti-streaming layer which quickly dries the surface and locks odors and wetness in while also preventing tracking. The surge layer underneath channels the liquid into its middle polymer core that turns the liquid into gel. The locking layer is what keeps the liquid-turned-gel in place. The polyethylene backing protects your floor from spills and leaks. If you’re concerned that housetraining your pup will be difficult you may find the All-Absorb Training Pads to be especially useful. It comes with built-in attractants that draw your puppy or dog to the pee pad, making it super-easy to train. At the bottom of the 5-layer pad is waterproof polyethylene, making sure you won’t have spills on your floor. Directly above the PE layer is paper tissue which also helps absorb moisture that may trickle down from the middle polymer layer. This super-absorbent core is what gives the All-Absorb its magic, turning liquid into soft gel. Aside from the polymer, the middle core also contains fluff pulp to help in liquid conversion. From the top, the All-Absorb is covered with non-woven cloth, allowing liquid to easily pass through the paper tissue layer where the dog attractant is embedded. Also in this layer is baking soda for optimum odor neutralization. The All-Absorb can hold up to 3 cups of urine. Unless you’ve got a dog with polyuria, this should last a few days or so. The Four Paws Wee-Wee Pet Training and Puppy Pads also come with 5 layers of pad construction that starts with a quilted top for quick-drying action. The same top design helps prevent tracking while keeping the layers together. Sandwiching the middle polymer core are two reinforcing layers which lock-in liquid and neutralize odor. The polymer core turns liquid into gel and is what actually makes the Wee-Wee quite interesting. The Floor Armor System keeps the 4 upper layers together while also protecting your floor from spills. The borders of the Wee-Wee come with plastic channels, keeping pet urine safe and eliminating spilling or leaking onto the floor. The Four Paws pee pad for dogs provides exceptional moisture-locking and odor-neutralizing capabilities on top of a reliable dog attractant for easier housetraining. The American Kennel Club’s Ultra-Absorbent Training Pads are perfect for pet parents who would like a variety of natural scents on the pee pads as well as a handful of design choices. While there are no indications as to what comprises its 6-layer pads, one can feel confident about the antibacterial and odor-eliminating properties embedded into the AKC pee pad. At any rate, you’ll be able to easily train your pup because of the attractant that is already integrated into the pee pad’s design. It costs less, too than other brands so it should come as a viable option for those who require cost-efficiency in housetraining dogs. 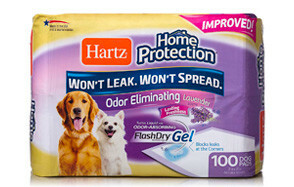 The Home Protection Dog Pads feature the FlashDry gel technology which is HARTZ’s way of saying it has a middle, super-absorbent core that turns urine into soft gel. Unlike other dog pee pads that come with baking soda-layered pads, the HARTZ is embedded with lavender to help neutralize the odor emanating from pet urine. Like the AKC pee pad, the HARTZ Home Protection Gel Dog Pads come with 6 layers, although there is no information as to what constitutes these layers. At the very least, you’ll find comfort knowing that HARTZ comes with non-tracking and leak-proof design. Not only do you get to easily train your pet, you also get to protect your floors from pet urine stains. It really is never easy picking a pee pad for dogs as the market can be very unforgiving especially for those who lack the basic understanding of what these products are and whether they’re right for certain types of dogs. To help you get a better grasp of how to buy the best potty pad for your pet we’ve prepared a guide and FAQ section just for you. Picking the right pee pads for dogs is almost the same as picking the best disposable diapers for your baby or even for an incontinent adult. Unfortunately, it is also not that easy since almost every other product in the market will come with almost exactly the same features. You may be able to narrow down your choices a lot further if you consider the following things you’d have to look for when buying pee pads for your dog. You will need a pee pad that will dry in an instant. This is a fundamental requirement of any absorbent pads. It helps to minimize, if not eliminate, wet and urine-soaked paws from getting imprinted onto your floor. You don’t want to be following your pet every time it steps out of the pee pad just to wipe dry its paw prints on your floor. The bottom panel or backing of the pee pad should be constructed of a waterproof layer to help protect your floor from urine seepage. Some products may also come with perimeter channels that help to keep the moisture within the center region of the pad, further eliminating the risk of leaks. The problem with ordinary absorbent materials is that they get easily shredded into bits once soaked. Try immersing tissue paper in water and you can easily shred it. That’s exactly what happens if a pee pad is not designed to be tear-resistant. It should be constructed of durable yet highly absorbent materials to resist shredding or tearing especially when already soaked with urine. Urine in itself is not foul-smelling. Unfortunately, the nitrogen it contains can react with bacteria and other microorganisms causing the bad smell associated with pet urine. Always go for products with natural deodorizers such as baking soda. Essential oils may also be good options for those who require a more pleasant scent. Most baby diapers come with wetness indicator, giving you visual clue as to when it’s time for a diaper change. The same is true with dog pee pads. There must be a way of knowing if it’s already time for a change in the dog pad. When you buy these pee pads your dog will not be able to use it immediately. You’d still have to train it how to use the pee pad. Helping you in this regard are natural attractants embedded into the design of the pee pad. These are like pheromones that entice dogs to use the pee pad to potty. Unfortunately, not all products will state just how much urine their pads can take before changing. For example, some products say they can hold up to 3 cups of urine while others will not give you an idea just how much urine the pee pad can hold. Using a dog pee pad to help teach your dog where to potty includes a series of steps. Bring your pet to the pee pad and place it on the pad several times every day. As soon as your dog starts to urinate, issue a verbal cue. Be consistent with this verbal cue. If your dog wants to urinate somewhere else, bring it immediately to the pee pad. Reward your pet every time it pees on the pad. Dispose of soiled dog pee pad and replace with new one. Move the pee pad closer to the door once your pet has consistently used the pee pad. Relocate the pee pad just outside the door once your dog has consistently used the pad near the door. Move the pee pad further away outside the home. What are Dog Pads / Pee Pads? Dog Pads are like super-thin yet super-absorbent diapers in a mat form. These resemble mats that are composed of several layers of various materials, each having their respective functions. As the name implies, pee pads are contraptions upon which your dog can urinate on without causing a leak onto the surface of the floor. As such these dog pads are made of both absorbent materials and waterproof bottom. Pee pads are useful in a variety of situations. For instance, if you’re housetraining your puppy, pee pads can provide a safe place for your pet to urinate inside the home. You don’t want your new puppy to be wreaking havoc throughout your house. Training it to use the pee pad will not only help it learn about the most ideal place to potty but, you’re also protecting your precious floor. Dog pads are also useful for dogs that are recovering from an illness. If they’re too weak to go outside for a pee, these pads can provide temporary relief. The same is true for dogs that are left at home alone for extended periods of time. Instead of coming home to a place that is reeking of pet urine, you’d do much better if you give your canine friend one of these pee pads to use while you’re away. These dog pads can also help pets with behavioral issues such as severe anxiety problems. There are dogs that are quite fearful of the outdoors especially in a thunderstorm. They will never want to go out because of this morbid fear. Getting them a pee pad should help them relieve themselves in such anxiety-provoking circumstances. Pee pads are versatile enough to be used in many other applications. For example, since these have quick-drying elements then can be used as doormats for your pet to walk on after coming in from the rain. It can also be used for drying its paws whenever it has stepped on damp surfaces. For traveling pet parents, pee pads can be great protectants for car seats so your pet will not be soiling on them. It’s also ideal as a liner for your pet crate as well as the carrier. How Do I Train My Dog to Use Dog Pads? 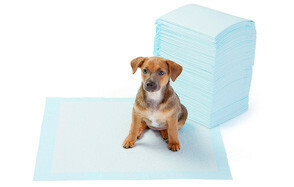 Teaching your pet to use the pee pad is almost similar to any other type of dog training session. First, you will need to introduce the pee pad to your dog as a normal part of its everyday existence. To optimize your training, it is critical that you understand the times when your pet is most likely to go. For most dogs, this is usually about 10 to 15 minutes after a meal. As such you need to time your training session. Throughout the course of the day, however, you may want to bring your pet to the pee pad whether or not it is going to pee. This is just to acclimatize it to the presence of the pee pad. When you think your pet is about to go, bring it to the pee pad and issue a verbal cue. You can use “go potty” or anything else that you can think of. The idea is for your pet to associate the ‘verbal cue’ with the behavior of peeing. If your dog tries to urinate somewhere else, bring it immediately to the pee pad and issue the verbal cue. If your dog successfully pees in the pad, give it its reward. What you want here is for your dog to associate the behavior (peeing on the pee pad) with something that is pleasurable (treats, plenty of hugs, more playtime, etc). By the time your pet has mastered urinating on the pee pad, you can move the pee pad near the door. This will teach them to go to the door if they want to potty. Once your pet has mastered going to the pee pad near the door, you can then move it outside. 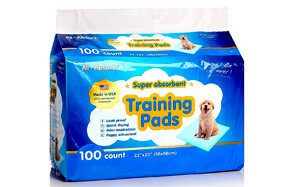 Dog pads are excellent items to be used for potty training dogs. When used properly, these potty pads can help your dog learn where to go when it really needs to go. These items are also useful for many other purposes. With the 5 best pee pads for dogs we’ve featured, we’re hoping you’re now more confident in securing the right product for your pet. There are some pet parents who are not really convinced that they need dog pads for their pets. You may want to look at the following pros and cons of dog pads to help you better understand whether this product is for your pet or not.